How is Body Fat Percentage classified? It is the proportion of the weight of body fat to the body weight. The obesity classification value advocated by Lohman (in 1986) & Nagamine (in 1972) is used as reference. How is Body Composition calculated? Omron Body Composition Monitor estimates the body fat percentage by the Bioelectrical Impedance (BI) method. Muscles or blood vessels are body tissues having a high water content that conduct electricity easily. Body fat is tissue that has low electric conductivity. Omron Body Composition Monitor sends an extremely weak electrical current of 50 kHz and less than 500 μA through your body to determine the amount of fat tissue. This low electrical current is not felt while operating the Monitor. The BI Method safely combines the electric resistance with the distance of the electricity conducted. In order for the Monitor to determine body composition, it uses the electrical impedence, along with your height, weight, age and gender information to generate results based on Omron's proprietary data of body composition. How is Visceral Fat classified? Visceral fat is body fat that is stored within the abdominal cavity and is therefore stored around a number of important internal organs such as the liver, pancreas and intestines. Visceral fat is sometimes referred to as 'active fat' because research has shown that this type of fat plays a distinctive and potentially dangerous role affecting how our hormones function and is associated with increased risks of a number of health problems such as diabetes. At times, the body fat percentage can be low while the visceral fat level is high. How is Skeletal Muscle Percentage classified? Why is it important to know your Resting Metabolism (RM)? 60-70% of daily energy use is for basal metabolism, 20-30% is for daily activity and 10% for diet-induced thermogenisis. Know your RM to avoid over-eating and to increase muscle mass. What does Body Age indicates? 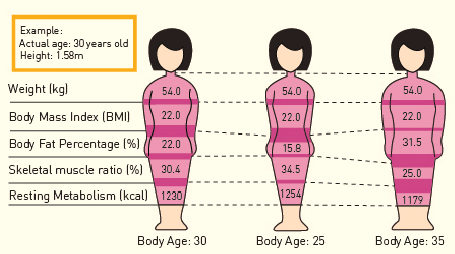 Body Age indication is based on one's RM and is used as a guide to one's metabolic age. To know ones's Body Age is useful to improve one's wellbeing. What is the ideal Body Mass Index (BMI)? In accordance with the international index to judge obesity, an ideal body weight is at BMI "22". Is there a recommended time to monitor body composition? The recommended time to monitor body composition is in the morning before you exercise, eat, drink or take a shower. Measuring it at the same time everyday will give you an opportunity to develop a comparable trend and track your progress. Copyright 2019 Omron Healthcare Asia. All Rights Reserved.